Founded in 2011, Inquivesta is widely recognized as one of India’s foremost science festivals. The fest is organized entirely by a committee of undergraduate students of IISER Kolkata. Attracting its audience primarily from the purlieus of Kolkata, Inquivesta encompasses a variety of events which include competitions, workshops, exhibitions, guest lectures and social outreach programmes. The fest seeks to provide collegiate and scholastic students a platform to develop and showcase their scientific, technical and creative prowess. 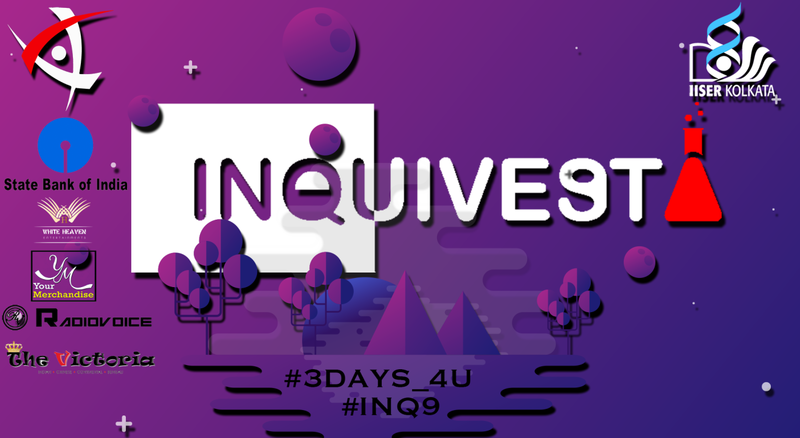 The 9th edition of Inquivesta is scheduled for 8-10 March 2019. The event is headlined by a band performance by Naalayak, a Chandigarh based Indie rock band, and the fest shall end by DJ Night. Naalayak is a 4 piece indie rock band from Chandigarh. Known for their explosive live acts and pumping music. They are now considered to be the genre defining new era of indie rock. They have been ranked No. 10 by Sennheiser Top Bands of India. Bad Mani (aka Manish Badaik) comes from a city named Rourkela in Odisha. He has been keen for music since he was in standard 7th. His ability to recreate the music patterns be it in any genre has always amazed his family and friends. Coming from a family which has no musical history is what amazes the people around him. He grew up with a dream of being a Coder working in some IT company but the fate had something else in store for him. He gradually ended up studying Science in National Institute of Science Education and Research (NISER) where he is still pursuing his 4th Year Int. MSc. in Chemical Sciences. After joining NISER the music inside him never actually died. He decided to pursue it as a hobby but after a year or more of struggle he got his 1st chance to play in a fresher’s party of a college. Right then right there he realised that he was born for music the happy faces around him was like a drug to him as he explains the moment. Since then he never stopped, he went on to play in different shows in Bhubaneswar. Then gradually he had shows flowing in from various event managers in and around Bhubaneswar, Kakinada, Ranchi, Kolkata and Chattisgarh. Right now he is based in Bhubaneswar and is pursuing his education and is also doing a job as an in-house DJ of a very happening club in Bhubaneswar.